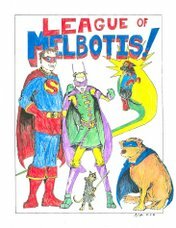 League of Melbotis: Four Super-Films For Super Cheap! Finally! Nuclear Man will be a permanent resident in my household! That's a pretty good deal even if you don't watch III or IV. 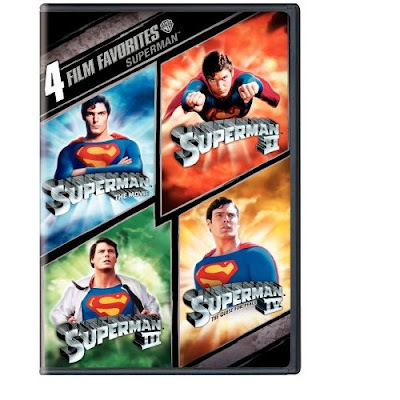 Oh, but, you know... once it's in your house, how can you NOT watch Superman IV? I still think there's a kernel of a good Superman movie in there, but its stunning to witness how it all went wrong. Not sure if this has the commentary track, but its a great commentary track as someone involved sort of details what went wrong for the duration of the movie. I don't think I ever saw IV in its entirety, though I remember bits and pieces from cable. I don't think I have seen III since it was in theatres. Well, perhaps this is fate's way of finally getting you to watch III and IV. But when you watch the movie, I expect you to wear a cape. Amazon sez it's 2 discs, so I think it's two flipper discs with one movie on each side. Hmmm... must not be much in the way of extras, if that's the case. Ah, well. It's $14.00. And saves the planet from 2 extra discs. That said, it probably still includes the commentary tracks. Unless they're hosers and pulled the audio for the cheapie release. I just love comparing Salkind's commentary on Supes II with Donner's on the Donner Cut DVD.